Guy J. Agostinelli is a founding partner of the firm. He was born Buffalo, N.Y., in 1955, and was admitted to the Bar of New York in 1981. Mr. Agostinelli is in charge the firm’s transactional practice and has closed numerous corporate acquisitions, real estate transactions involving millions of dollars, Industrial Development Agency bond transactions, bank financing and development deals. He also heads up the firm’s Construction Law Practice, both contracts and litigation, representing developers, surety companies and several of the region’s largest general contractors. He was admitted to practice by the United States District Court, Western District of New York in 1981; the United States Court of Appeals for the Second Circuit in 1989 and the United States Supreme Court in 1994. 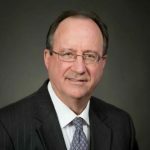 He has been recognized in Who’s Who in Buffalo Law in 2007 and in 2011, and in Super Lawyers®, for Corporate Law, in 2008-2015 (Upstate New York Edition). His primary practice areas are Construction Law; Corporate Law and Real Estate Law.